CHARLOTTE AMALIE – The U.S. Customs and Border Protection (CBP) Field Operations office held its first Global Entry enrollment event in St. Thomas recently. The event was held October 14 to 15 at the Cyril E. King International Airport security office from 8 a.m. to 4 p.m.
Forty-seven United States Virgin Island residents and visitors came out to take advantage of this convenient opportunity to join Global Entry without having to travel for the enrollment interview. 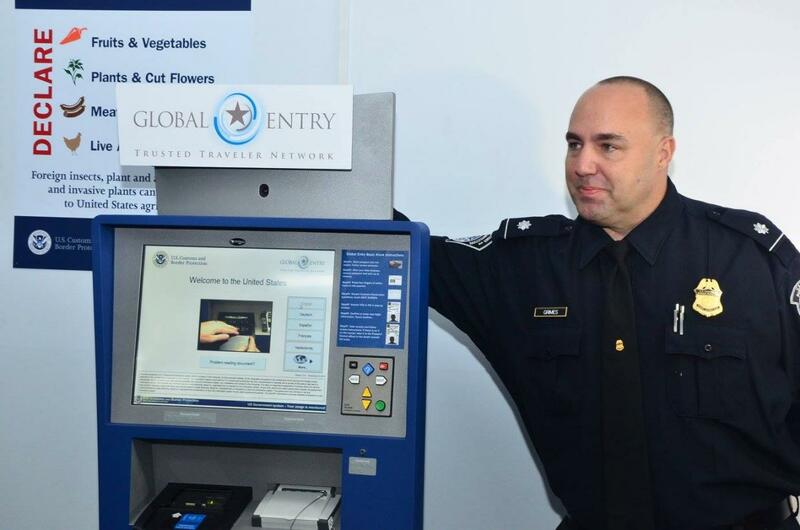 Global Entry is a Trusted Traveler program that makes international travel easier for its low-risk pre-approved members by allowing them to use kiosks for CBP processing instead of having to stand and wait in the regular lines. Global Entry members also enjoy TSA Pre-Check benefits. This means they can also speed through TSA security on all participating airports, using a designated fast lane without having to remove shoes, laptops, liquids, belts and light jackets. Many participants stated they were very pleased with the opportunity of completing their applications here and hope that CBP will host future Global Entry Enrollment opportunities in the US Virgin Islands. The event was part of a San Juan Field Office initiative that intends to set a Remote Enrollment Center in the territory so locals can benefit from regularly scheduled enrollment events without having to travel to San Juan to become members.